The weather is finally cooling down here. Just makes me want to curl up with a good crochet project and a cup of coffee. I noticed that several posts in the Crochet N More Guestbook were "spam". If you notice anything strange or non-crochet related please email me... thanks. You may be able to embellish these patterns to use as carousel horses. "Whatever you can do or dream, you can begin it. But I rejoiced in the Lord greatly, that now at last you have revived your concern for me; indeed, you were concerned before, but you lacked opportunity. Not that I speak from want; for I have learned to be content in whatever circumstances I am. I know how to get along with humble means, and I also know how to live in prosperity; in any and every circumstance I have learned the secret of being filled and going hungry, both of having abundance and suffering need. I can do all things through Him who strenghtens me. The word is a lamp to my feet, and a light to my path. I have sworn, and I will confirm it, that I will keep Thy righteous ordinances, I am exceedingly afflicted; revive me, O Lord, according to Thy word. TAKE TIME TO LISTEN ." On which mountain did Moses see the burning bush? 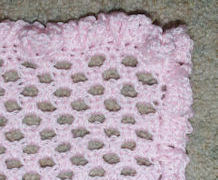 A Long Double Crochet Stitch is worked the same as a regular double crochet stitch, except... it is worked in a stitch on a row below the normal working row. When changing yarn colors within a multi-color project, work the last stitch of the current color without completing the last step. With the new color, yarn over and draw the new color through to finish that last stitch. I am looking for a pattern for a scarf/shawl with cuffs (not sleeves) to keep a senior warm across the shoulders but not have trailing edges to be a hazard in the kitchen. Ideas anyone? I haven't seen any patterns that are shorter on the arms but these two patterns might be helpful. You must log in to see them. Would anyone know this pattren for making theses booties , if so I would love to make them for my grand niece , thanks so much for your help. These are adorable. However, I haven't been able to locate a pattern like this. I will keep an eye out on future searches. I just bought my first skein of bulky yarn and ready to make a scarf, however, I have been finding patterns that require 2 kinds of yarns or the pattern is too hard. Do you have a scarf pattern for a beginner crocheter using one type of yarn? You can do the fringe in the same yarn or leave it off. However, I haven't been able to locate a pattern like this. 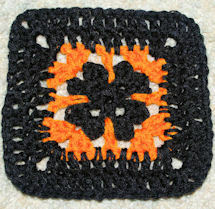 NOTE: If you like to help fellow crocheters... take a look at the photo on the above post and see if you can help Norene. Thanks! Lisa, May u be blessed by the truth of God's Word. Also I have been searching for instructions on how to make booties and beanies to enlarge from newborn size to child size. I would appreciate any info. U may have on this. I thank you very sincerely for all ur help. 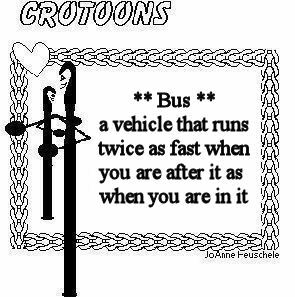 I have crocheted so to speak for yrs. but it was my own made up stitch. U have taught me how to read pattern, correctly done stitches and most importantly how to count stitches and rows. 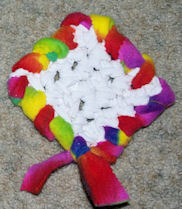 more about the art of crochet. 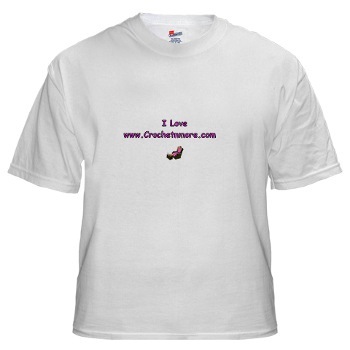 have various sizes listed. Do you have a specific pattern in mind? thank﻿ you for this video! I﻿ can watch your videos all day. 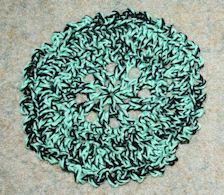 Can I use﻿ this pattern to crochet place mats? Yes you can... the pattern is crocheted from one end to the other... just stop when you get the length you want. If you want it larger you can add a border. For Row 8 you chain 3, then turn the work. (Skip one stitch, work a half double crochet in the next stitch, chain 1) now repeat the instructions in parentheses around to the last stitch. Join with a slip stitch in the second chain of the beginning chain 3 (skipping that last stitch). 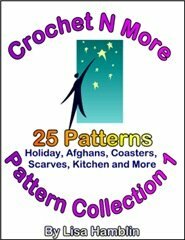 I am hoping that you can help me, I crochet with graphic patterns and i am desperately looking for a pattern for a beret but in graphics, can you pleeeeez help me. 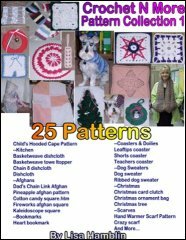 I haven't seen many graphic or symbol crochet patterns available. the country's greatest works of art. Since there was no one to look after her grandmother while she was away, she took the old lady with her. At the Sistine Chapel in the Vatican, she pointed to the painting on the ceiling. "Grandma, it took Michelangelo a full four years to get that ceiling painted." "Oh my, "the grandmother says. "He and I must have the same landlord." Arcelor-Mittal Steel Company, feeling it was time for a shakeup, hired a new CEO. As a priority, this new boss was determined to rid the company of all slackers. On a tour of the facilities, the CEO noticed a guy leaning against a wall. The room was full of workers and he wanted to let them know that he meant business. He asked the guy, "How much money do you make a week?" Feeling pretty good about himself, the CEO looked around the room and asked, "Does anyone want to tell me what that goof ball did here?" From across the room a voice said, "Pizza delivery guy, from Domino's." some buzzed, some rang, some warbled. We made a game of guessing what the next bell would sound like. At the precise moment she touched the doorbell at one house, the church tower began to chime. She wheeled around with a look of amazement on her face. "Now that's a doorbell!" "It was enough to make anybody faint," he said. "My son asked me for the keys to the garage, and instead of driving the car out, he came out with the lawn mower!" My wife is a teacher; it's really weird to live with a teacher. I'd be on the phone, doodling on a piece of paper, leave the house, come back in two hours and that same piece of paper is now on the refrigerator with the words "Good work!" and a big smiley face on it. The telephone solicitor selling basement waterproofing must have thought she'd died and gone to heaven when she reached my very polite and patient son on the phone. At the end of her long sales pitch, she asked, "Do you mind if we send out someone to give you an estimate?" A guy took his girlfriend to her first football game. Afterward he asked her how she liked the game. week. "Hey," he called out, "who owns the car with the plate "I ate again?" "Madam," he announced, "I'm the piano tuner." During his sermon, our pastor quoted Matthew 19:19, "Love your neighbor as yourself." To emphasize the point, he asked three times, with increasing intensity: "Who is my neighbor? Who is my neighbor? Who is my neighbor?!" Each time he asked, a young boy behind us answered (mimicking the pastor's intensity, but not quite as loud): "Mister Rogers! Mister Rogers! Mister Rogers!" A man feared his wife wasn't hearing as well as she used to and he thought she might need a hearing aid. Not quite sure how to approach her on the subject, he called the family doctor to discuss the problem. The Doctor told him there is a simple informal test the husband could perform to give the doctor a better idea about her hearing loss. Here's what you do," said the Doctor, "stand about 40 feet away from her and say something in a normal conversational speaking tone see if she hears you. If not, go to 30 feet, then 20 feet, and so on until you get a response." That evening, the wife is in the kitchen cooking dinner, and he was in the lounge. He says to himself, "I'm about 40 feet away, let's see what happens." Then in a normal tone he asks, 'Honey, what's for dinner?" No response. So the husband moves closer to the kitchen, about 30 feet from his wife and repeats, "Honey, what's for dinner?" Still no response. Next he moves into the dining room where he is about 20 feet from his wife and asks, "Honey, what's for dinner?" Again he gets no response. So, he walks up to the kitchen door, about 10 feet away. "Honey, what's for dinner?" Again there is no response. So he walks right up behind her. "Honey, what's for dinner?" Then he suddenly hears her say, “Ralph!, for the FIFTH time, - it's CHICKEN!"